I visited a factory today. Giant robots did all the mixing, pouring, packaging, and even shrink wrapping. It was amazing! The final product? Grind up 48,000 tons of fresh jalapeno peppers, add vinegar, salt, sugar, and garlic and you get- you guessed it!- one of America’s favorites, with over 20 million bottles sold last year, Huy Fong’s famous Sriracha sauce. The Huy Fong factory in Irwindale offers tours to the public three times a day, four days a week. I have an ulterior motive for visiting this factory and writing this article. I love the hot sauce, as it’s delicious on noodles. At 2500 Scoville Units (compared to 350,000 for a raw jalapeno) the sauce delivers a pleasant zap without a painful burn. The factory is a model of hygiene and efficiency. The robotics are mind-boggling, a sight to behold with long conveyor belts moving along battalions of uniform bottles through custom-made machinery that washes, grinds, squirts, and mixes, and giant lever arms that grab, lift, and pack dozens of filled bottles into giant crates, finally landing on a spinning platform for shrink-wrapping. All this is fascinating and worth seeing. But the reason I am most interested in this factory is the story of the man who created it, a Vietnamese-American with my same last name, David Tran. He almost died as a South Vietnamese soldier during the Vietnam War. He escaped on an American helicopter because the pilot was willing to jettison his motorcycle so they could lift off with Tran on board instead. Tran came to America on a Taiwanese ship named the Huy Fong, which means “Gathering Prosperity” (hence the name of his company). 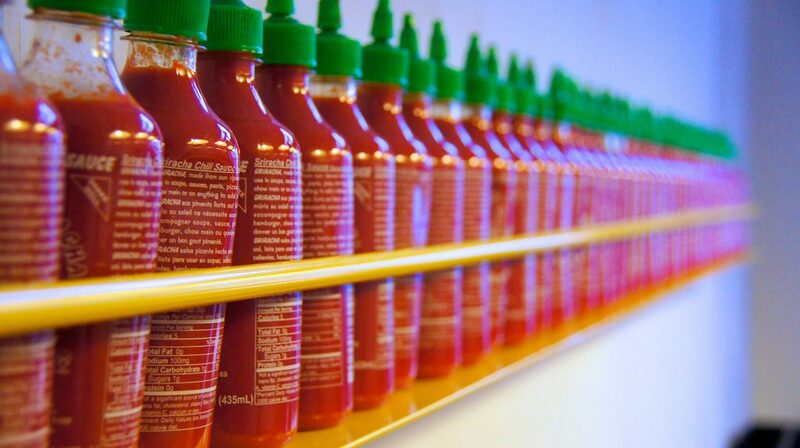 Being Vietnamese, Tran couldn’t find a chili sauce in America to his liking, so he created his own. His friends liked it too, so he began a small business bottling sauce in recycled baby food jars and transporting them in the back of his blue Chevy van. Eventually he got a delivery van upon which he himself painted a logo of a rooster. Now his factory is over 650,000 square feet big and does $100 million of business a year, using the latest in automation that he helped to design. “Be bold. Don’t be a turtle. Stick your head out. Think outside the box. Take all the suggestions, but in the end, make the decision yourself. For example, the Rosemead plant was built against objections by all- why are you building that? For Irwindale, the same question, why are you doing that? Don’t make people sick (to) make money. Do not sacrifice quality in making money. I already faced death once, why not take care of everyone, this is my second life. Never argue with the government over taxes. Pay your share and don’t take it overseas. I love Tran’s business model. He’s unusual in that he hasn’t spent a dime on advertising and has raised the price on his sauce only once since the 1980’s, as his motto has always been “to provide a rich man’s sauce at a poor man’s price.” He pays a living wage to his employees, provides full health insurance, and offers a matching 401K retirement fund. Tran has had many lucrative offers to sell out, but never did; in his 70’s, he still comes to the plant every day. Clearly, this is a person who loves his business and is proud of producing an excellent product at an affordable price for his customers, while treating his employees fairly. He sees paying his taxes as his way of giving back to the government and showing gratitude to his new country by being a productive, contributing citizen. I think his attitude demonstrates all the principles of integrity, social justice, responsible risk-taking entrepreneurship, and concern for the common good that make this country great. David Tran’s story and beliefs exemplify what it is to be an American, and should inform and inspire all immigrants. I hope his story also informs and inspires the powers-that-be to appreciate immigrants. May his hot sauce cool down the hotheads who view potential immigrants with fear and suspicion. After all, you must admit, at this point Sriracha is as American as apple pie.